Do you have a dessert weakness? Is there one sweet treat that really floats your boat? My weakness is brownies. Not just any brownie will do. I like my brownies chocolatey, moist, and chewy. While I like nuts, I prefer my brownies to be nut-free. Most of all, I like my brownie warm with a scoop of vanilla ice cream. 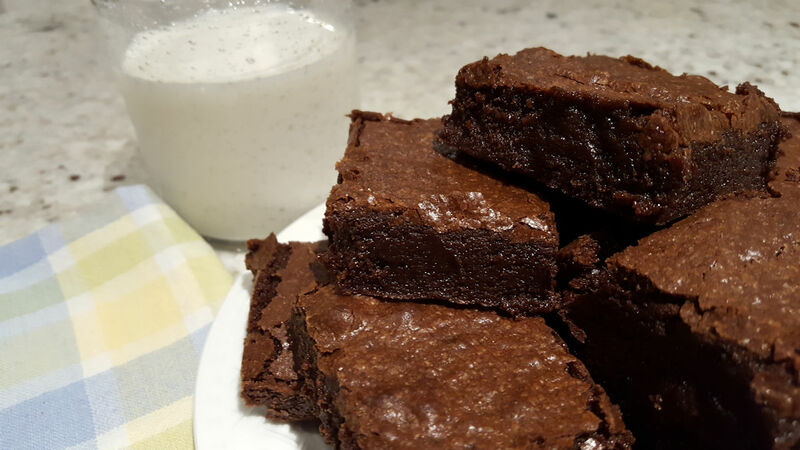 The trouble is, brownies must be a once in a great-while treat. You know what I mean. It's a slippery slope. You eat one brownie, then another, and before you know it the whole pan is gone! Today I'm sharing a from-scratch ultimate brownie recipe that will certainly tempt you to eat the whole pan. This recipe is one that came about as a result of a search for the best from-scratch brownie I conducted several years ago. I wanted to find a recipe that would consistently produce the kind of brownie I like. In order to get the perfect recipe, I had to combine a couple of really good recipes to get one great recipe. This recipe is for you if you love an intensely chocolate brownie that is very moist with a hard, crunchy top. The bittersweet chocolate chips produce a dark chocolate brownie. You can substitute semi-sweet or milk chocolate chips, but you'll have a different brownie than these. The only step that makes this recipe a little more effort than brownies from a box is melting the butter and chocolate chips together in your microwave. You're actually going to put the chocolate mixture in your microwave twice, but it will only take you about three minutes in total. Remember not to overbeat your brownie batter. 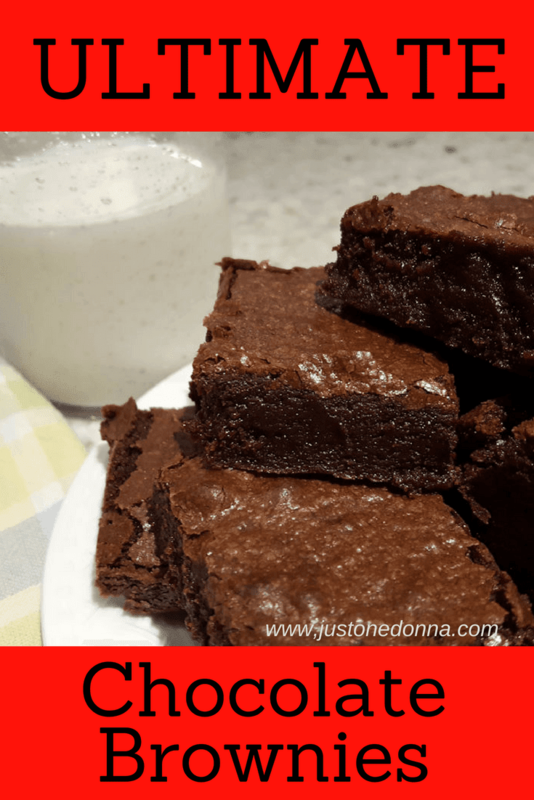 There is no need to use an electric mixer for this recipe, or any brownie recipe for that matter. You only want to mix the ingredients long enough to combine them. Preheat your oven to 350 degrees, F. Prepare a 13x19 inch glass or light metal baking pan by lightly greasing it and lining it with parchment paper. 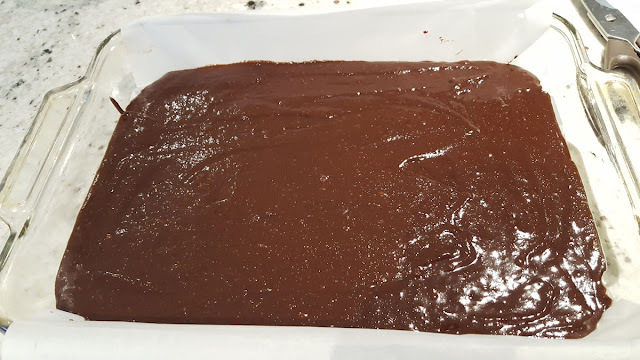 Let the parchment paper overhang the sides so you will be able to remove the brownies in one large piece to cut into squares. Crease the edge of the parchment along the sides to be sure the paper doesn't fold back onto the brownies. 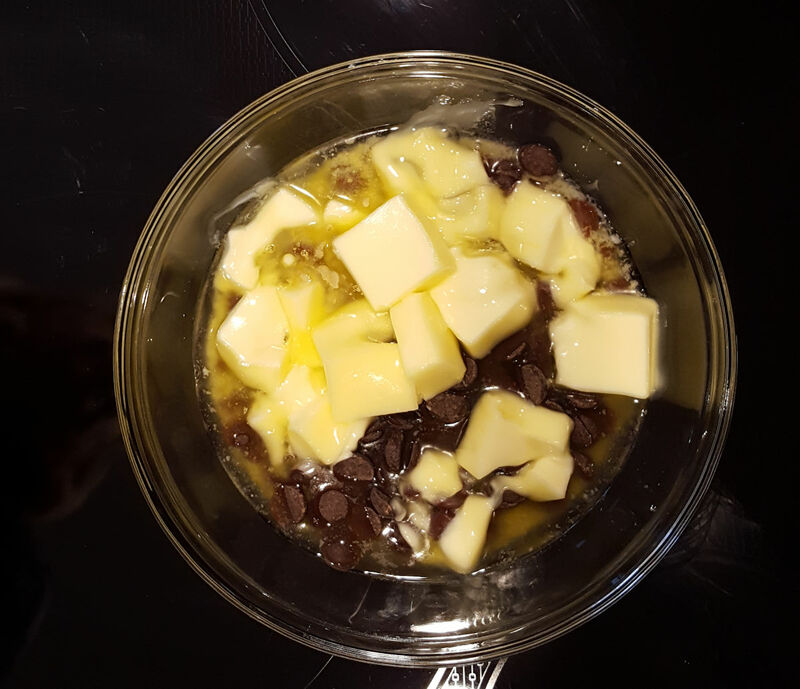 Add the chocolate chips and butter together in a large heat-resistant bowl. Microwave the butter and chocolate chips on medium-high, stirring after every 30 seconds until the chocolate chips are melted. Stir to make sure the butter and chocolate are well combined. Add the granulated and brown sugars to the chocolate mixture stirring to combine well. Return the chocolate mixture to the microwave and reheat for one minute. Stir well and set aside to cool. Break the eggs into a bowl and beat slightly with a fork to break up the yolks. When the chocolate mixture has cooled to slightly warm, add the eggs and mix with a whisk until just combined. 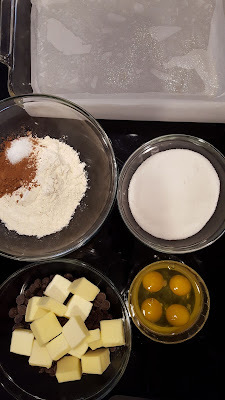 Overbeating the eggs will result in a cakey brownie texture. We don't want cakey brownies with this recipe. Stir in the vanilla. Mix the flour, salt, and cocoa powder together in a small bowl with a whisk. Add the flour mixture all at once to the chocolate mixture. Fold the flour mixture into the chocolate mixture using a silicone spatula. Spread the batter into the prepared pan. Bake for 30-35 minutes or until a toothpick inserted in the center has a few moist bits on it. Cool completely before cutting. 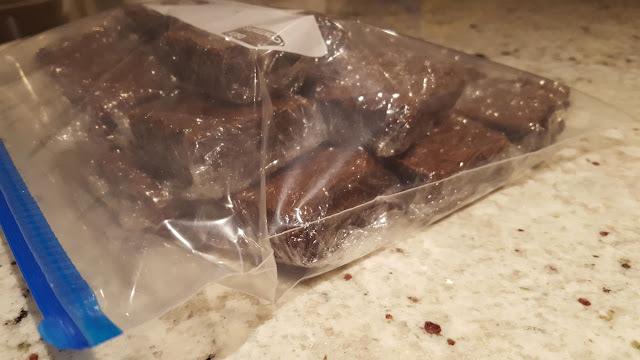 If you are in danger of eating the whole batch, like me, wrap the brownies individually in plastic wrap and freeze them in a freezer bag. Here are some other favorite from-scratch brownie recipes.